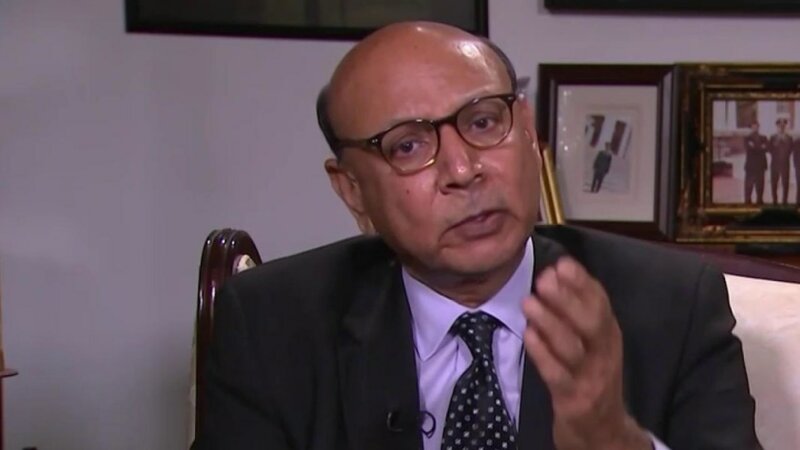 Donald Trump’s first reaction to Army father Khizr Khan’s passionate Democratic National Convention speech was to question Khan’s wife’s silence, implying Ghazala Khan wasn’t allowed to speak during the speech because she is Muslim. "If you look at his wife, she was standing there. She had nothing to say. She probably, maybe she wasn't allowed to have anything to say. You tell me, but plenty of people have written that she was extremely quiet, and it looked like she had nothing to say," Trump told ABC News’ George Stephanopoulos in an interview published Saturday. 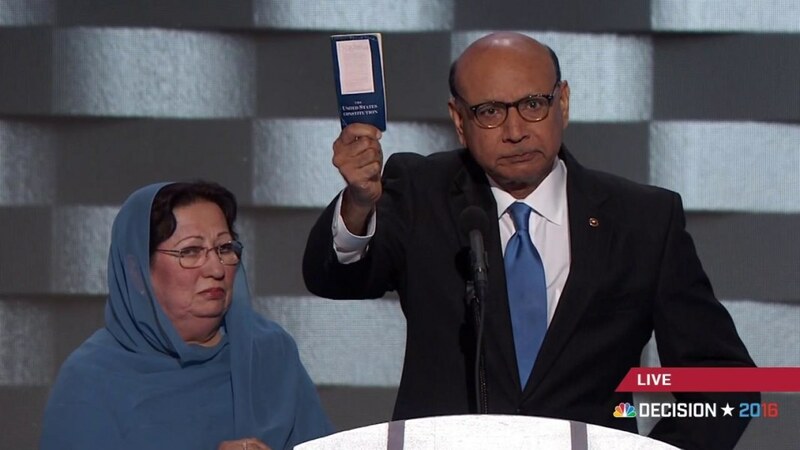 On Thursday at the DNC, Khan spoke of his son, U.S. Army Capt. Humayun Khan, who was killed by a car bomb in 2004 while guarding the gates of his base in Iraq, saving the lives of his fellow soldiers and civilians. Khan’s son was posthumously awarded a Bronze Star and a Purple Heart. At the DNC, Khan said Trump has "sacrificed nothing and no one." 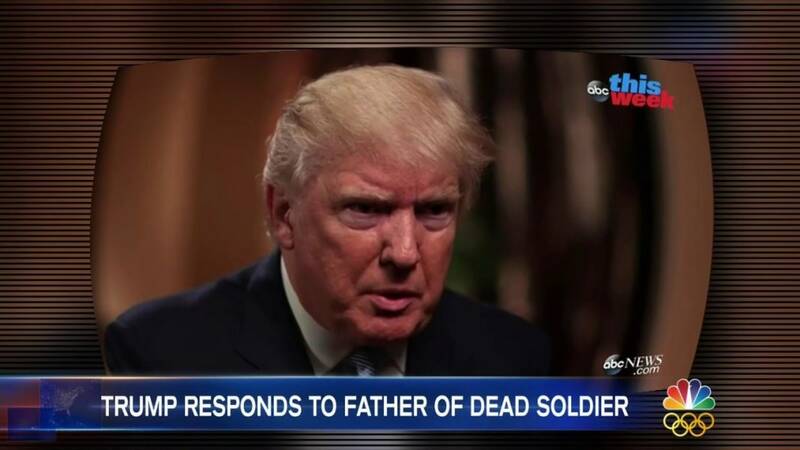 Trump rebutted Khan, telling Stephanopoulos that he has made sacrifices through his success as a businessman. He also questioned if Khan wrote his own speech, asking, "Who wrote that? Did Hillary's scriptwriters write it?" The Clinton campaign had offered the services of a speechwriter, but according to Politico, Khan declined, opting to write his address himself. Trump said, "I think I've made a lot of sacrifices. I work very, very hard. I've created thousands and thousands of jobs, tens of thousands of jobs, built great structures. I've had tremendous success. I think I've done a lot." In an interview with Maureen Dowd of The New York Times on Friday night, Trump’s only response to Khan’s speech was simply: "I’d like to hear his wife say something." Ghazala Khan explained to MSNBC’s Lawrence O’Donnell on Friday that she was anxious during her husband’s speech, knowing her son’s photo would appear behind her. "It was very nervous, because I cannot see my son’s picture and I cannot even come in the room where his pictures are, and that’s why when I saw the picture on my back, I couldn’t take it. And I controlled myself at that time, so it is very hard," she said. Khizr Khan also noted to O’Donnell that he could not have spoken at the DNC without his wife’s close support. "Her being there was the strength that I could hold my composure. I am much weaker than she is in such matters," Khan said. Hillary Clinton said in a statement Saturday: "I was very moved to see Ghazala Khan stand bravely and with dignity in support of her son on Thursday night. And I was very moved to hear her speak last night, bravely and with dignity, about her son's life and the ultimate sacrifice he made for his country." Clinton's statement did not mention Trump by name. "This is a time for all Americans to stand with the Khans, and with all the families whose children have died in service to our country," Clinton said. "And this is a time to honor the sacrifice of Captain Khan and all the fallen. 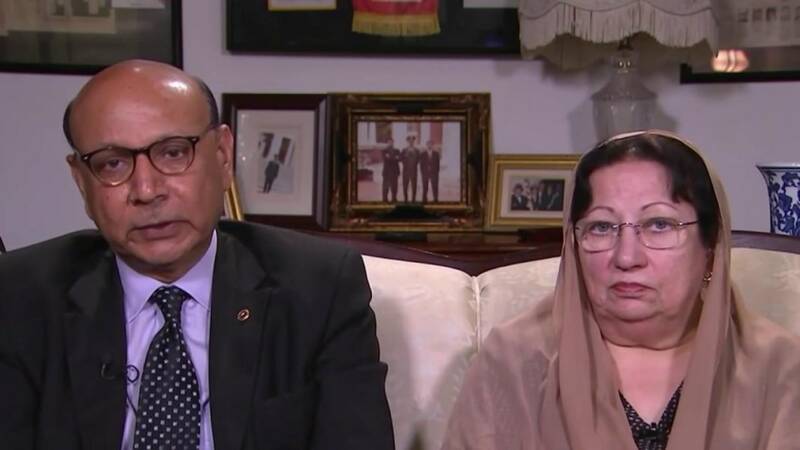 Captain Khan and his family represent the best of America, and we salute them." Khan clarified to O’Donnell that the other message in his speech was directed toward Republican leaders House Speaker Paul Ryan and Senate Majority Leader Mitch McConnell, calling on them to denounce Trump. Khan vowed that he will continue to pressure McConnell and Ryan to stop Trump, calling it a "moral imperative" to do so. Otherwise, he said they will "sink the ship" of the Republican Party. Ryan has previously rebuked Trump's proposed plan to temporarily bar Muslims from entering the U.S. On Saturday, a spokesperson for Ryan said the House speaker does not support the proposal and has spoken out about it. "The speaker has made clear many times that he rejects this idea, and himself has talked about how Muslim Americans have made the ultimate sacrifice for this country," spokesperson AshLee Strong said. The marshal, Brett Lacey, was named Civilian of the Year in February for his work after the shooting at the Colorado Springs Planned Parenthood clinic in November.